Energy Efficiency Services Limited (EESL), a Super Energy Service Company (ESCO) under the administrative control of Ministry of Power, Govt of India, has signed a Memorandum of Understanding (MoU) with the General Administration Department (GAD), Government of Maharashtra to lease out electric vehicles and install EV chargers in state government offices. The vehicles would be provided under the Government of Maharashtra’s Electric Vehicle and Related Infrastructure Policy – 2018. 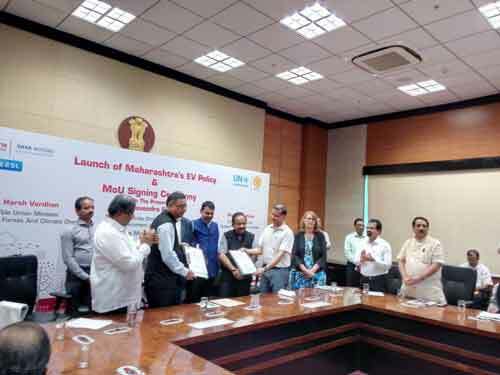 The MoU was signed in the presence of Shri Devendra Fadnavis, Hon’ble Chief Minister, Government of Maharashtra; Dr Harsh Vardhan, Hon’ble Union Minister of Environment, Forest and Climate Change; Shri Diwakar Raote, Hon’ble Minister for Transport, Government of Maharashtra; Shri Erik Solheim; Executive Director, United Nations Environment Programme, and Shri Saurabh Kumar, Managing Director, EESL. 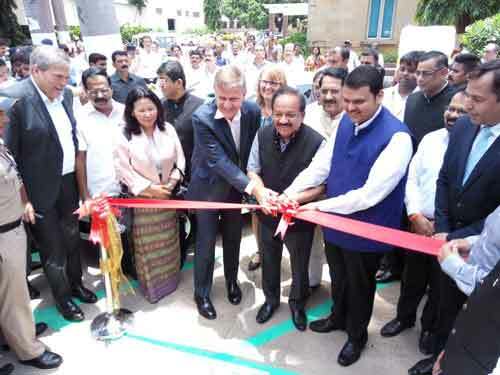 Marking the commencement of e-mobility era in Maharashtra, Shri Devendra Fadnavis flagged off the first set of 20 EVs at the Gateway of India in Mumbai. The Government of Maharashtra announced its Electric Vehicle and Related Infrastructure Policy – 2018 with a vision to establish the state as a globally competitive destination for electric vehicles and component manufacturing while simultaneously promoting their wide-spread adoption. The MoU between EESL and Maharashtra will support the state government’s vision of generating investment worth `25,000-crore in EV and component manufacturing, assembly enterprises and charging equipment manufacturing. The policy also entails increasing the number of registered EVs in the state to five lakh and creation of one lakh jobs.